I never really liked history in high school. Because of what I ended up doing in life - researching West Texas music, especially that of Buddy Holly and the Crickets, publishing my findings and interviews I had done et al - I not only became interested in history, I also became a sort of detective as some of the “facts” I had collected didn’t add up. I’ve told people you have to take all the pieces of factual information about something you have at hand and put those pieces together into a puzzle. It’s those pieces that don’t fit the puzzle that you have to do your digging and detective work on, to find out whether they indeed do fit, and where they go, and then see what the results are. A good example of this is in my “Buddy Holly - Day By Day” series pertaining to the date of the recording session at the Officer’s Club at Tinker Air Force Base in Oklahoma City. The piece is titled “Pieces Of A Puzzle” and shows how digging deeper into something makes a new result that everyone can agree to. I’ve been interested in my family genealogy for quite some time and have been researching my family line for almost thirty years now. After I ceased publishing my magazines after thirty years, I began doing my genealogy research with greater enthusiasm. I had one brick wall pertaining to my 5th great grandfather, Ichabod Griggs. There was very little information in any town’s vital records, and the dates and age on his cemetery marker simply did not add up. I never gave up and then suddenly had a breakthough. I now know his vitals (birth, death etc.) with the files and historic records to back it all up. Just to give you an idea of what the detective work is all about [albeit it doesn’t pertain to music], and how constantly digging for more information finally leads you to a conclusion, I wrote a piece for a genealogy magazine titled “The Saga Of Ichabod Griggs” and have presented it here for you to read. It’s not that long and I think you’ll get an idea how this research works. 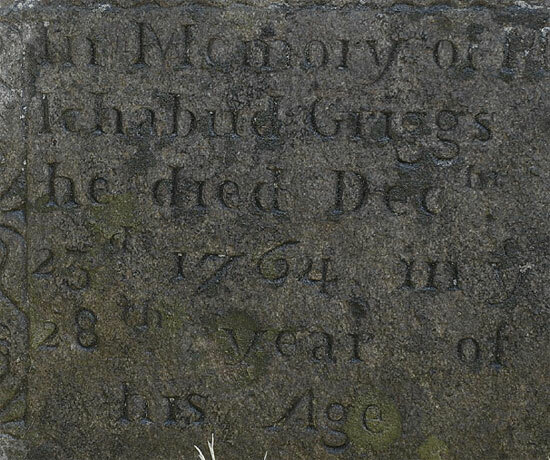 The only “fact” about my 5G Grandfather, Ichabod Griggs, was that he died on 28 Dec 1764, according to his grave marker in the Old Cemetery in Eastford, CT. No date of birth was been found in any vital records. The book “Genealogy Of The Griggs Family” gives a birth year of 1727, but the entry in “Genealogies of Woodstock Families” gives a birth year of 1737. Both state he was born in Ashford, CT. and died at age 28. We did know that he married Lydia Wright on 8 Sep 1748 in Ashford as that fact does appear in the Ashford, CT vital records. Now the problems began. All available research shows he had at least four children - Nathan, born 2 Jun 1749, Joseph, born 1 Mar 1751, Ichabod Jr, born 4 May 1753, and Lemuel, born 25 May, 1755 - all born in Ashford, CT. Wait a minute. Some simple math would show that if Ichabod was born in 1737, then he was eleven years old when he married and only twelve when his wife gave birth to their firstborn. Not really plausible. If you use the 1727 birth year, then he would have been 21 at marriage and 22 when his first child was born. This works out better except his grave marker clearly states he was 28 when he died in 1764. I’ve always accepted that 1727 birth year date as it makes more sense. His wife, Lydia, was born 3 May 1728 which makes more sense with the 1727 date than the 1737 one. 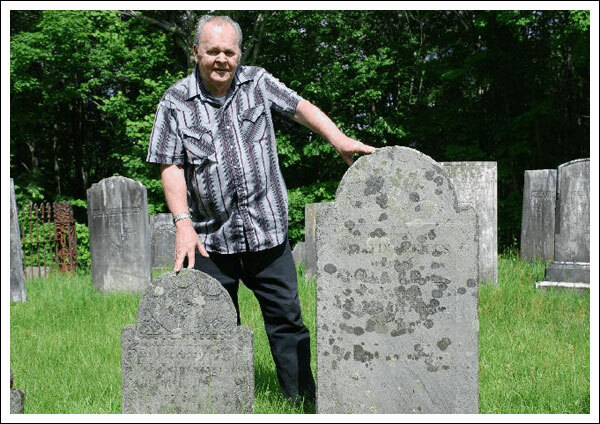 I’ve been told that perhaps I had located the wrong marker at the Old Cemetery in Eastford, CT., or I had the wrong Ichabod Griggs (there are a lot of Ichabods in the Griggs family.) That is the only marker at that cemetery for an Ichabod Griggs, and it is located next to that of Lydia Griggs (1728-1801), his wife. No, it is the correct marker and it is the correct Ichabod. Let’s leave that for a moment and look at his son, Ichabod Jr. He was born on 4 May 1753 and died 25 Dec 1755, according to the vital records of Ashford. His marker has not yet been located so these are the only dates we can go by. This mystery of sorts went on for years until June 2009 when I was visiting my sister in Connecticut (I’m now living in Texas.) I decided to go to the State Library in Hartford and make one more search for Ichabod’s birth in Ashford. I didn’t find it while searching the Ashford records, BUT, I came upon some estate and guardianship records for Lydia Griggs, dated 1756 and 1757. This was a double bombshell as these records show that Lydia Griggs was claiming guardianship of her two minor sons, Ichabod and Lemuel, and that she was a widow. The guardianship papers were dated 2 Mar 1756, and the estate papers were various dates from 1755 and 1756. Further, another paper dated 8 May 1768 was found showing Abijah Griggs, a younger brother of Ichabod, claiming guardianship of Ichabod Jr., a minor. First things first. The Ashford vital records state that Ichabod Jr. died on 25 Dec 1755. How can that be if his Mother was asking for his guardianship a year after that, and his father’s brother was claiming guardianship of him as a minor in 1768. Ichabod’s marker states he died at age 28. If we accept the 1727 birth year date and add 28 to that, we come up with 1755, the year that Ashford give for the death of Ichabod Jr. The clincher came on October 2, 2009. When I stated all those dates above as being from the Ashford vital records, I was using the “original” handwritten records as seen on the microfilm obtained from the LDS Church. This is the primary source used for all of those books, genealogies, and other reports on Ichabod Griggs and his family. After each children’s entry, it states the name and “son Ichabod by Lydia born”, and then the appropriate date. The entry after the birth of Ichabod Jr. Stated, “Ichabod Griggs (then four sets of quotes to mean “son Ichabod by Lydia”) and then the word “deceased” and the date. I kept going back to that entry looking for clues and then I saw it. ALL of the handwriting on the page was by the same person, from the same pen, written at the same time. These handwritten records on microfilm were COPIED from another source. A phone call to the town clerk of Ashford, CT came next. I asked that she get the original handwritten records from the vault and read me what appeared in Volume 2, page 77. When she got to the line after the birth of Ichabod Jr., she said it stated “deceased”. I asked if there was anything else on that line including quote marks. She said no. I ordered a certified copy of that page and waited patiently for it to arrive. It came on October 9th. What a revelation! The handwriting for the various entries were different and it appeared that three types of pens were used for the six entries. Each of the children’s entries stated the name, followed by “son of Ichabod Griggs born to him by Lydia his wife”, then the appropriate date. This was quite different wording from the “original” handwritten records on the microfilm everyone up to that time had been using. Above are the entries as seen in the microfilm from the LDS Church. Check out the handwriting and the text not quoting exactly from the original.Below is the original entries from Vol. 2, page 77 of Ashford’s original vital records. Then comes the entry under Ichabod Jr. 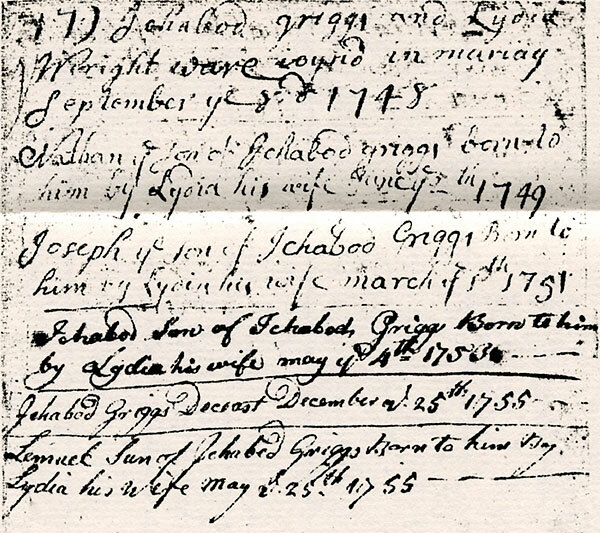 In different handwriting, and different pen, the complete line stated, “Ichabod Griggs deceased December 25, 1755". It appears that Ichabod Griggs SENIOR died in 1755 and that death was attributed to Jr. instead of Sr. when those entries were rewritten. That only leaves one more mystery to solve, that of the death year of December 23, 1764 on Ichabod Sr's marker. Could the stone carver had made a mistake? Should the 1764 be 1755? If you go back to the beginning of this article, I said that the only fact was that he died in 1764. Perhaps that is not a fact after all. at Old Cemetery in Eastford, Connecticut.